The first time I looked into an open chest cavity at a heart muscle working to pump blood through the body, I was brought up short by the tragic graffiti of atherosclerotic plaque. This waxy goo, often found in overweight people, builds up in the vessels surrounding the organ in which, philosophers tell us, the soul lives. But I quickly pushed any such distracting thoughts from my mind. I was learning to operate and was frankly thrilled at the prospect of harvesting a leg vein to bypass the blockage. Surgeons are trained to think that way, and rightly so. Do a good day's work and a life is saved, a bad day's work and a patient dies. No room there for anything but the job at hand. My objective was to heal with steel. That, in some ways, was the easy part. What confounded my colleagues and me was how and why our patients landed in our care in the first place  lying on a gurney, about to have their chest opened with a band saw. The biggest reason was often the simplest one: the food they ate. Our natural history as a species is a vast canvas of events whose peaks and valleys, successes and tragedies were often determined by the availability or scarcity of food  that is, until the 20th century. While famine remains a terrible reality in some parts of the world, most of us have almost unrestricted access to food. We produce a safe and abundant supply of fruits, vegetables, meats and dairy; we seal it, freeze it and protect it from spoilage and contamination. We even fortify it with vitamins and other healthy additives. This was the kind of bounty early civilizations could only dream of. But our triumph of nutritional ingenuity has had an unfortunate inverse effect. A dietary free-for-all, in the U.S. and elsewhere, is producing not the healthiest generation in history but one in steady decline, with epidemics of obesity, cardiovascular disease and diabetes. More than two-thirds of U.S. adults, and more than a third of kids, are overweight or obese. The problem isn't that people don't want to eat well and be well. Trust me, no one who's ever been wheeled into my operating room is happy to be there. And the problem, believe it or not, isn't that they doubt the wisdom of a healthy diet. More often than you'd think, the problem is that a lot of folks just don't know what a healthy diet looks like  and why should they, since the rules keep changing? Time was, red meat was healthful, and pasta was bad; then pasta was great, and red meat was terrible, all of which lasted until the Atkins craze came along and the rules flipped again. There were the Mediterranean diet and the South Beach diet and the low-fat diet and the grapefruit diet and, yes, the cabbage-soup diet, and all of them promised great things. Red wine is the newest route to health, unless of course it's dark chocolate  or unless it turns out to be neither. With every cure, it seems, comes a problem; every new truth somehow turns out to be part myth. The good news is that we now know so much more than we ever did about how food reacts in our bodies  how specific molecules affect specific functions of specific cells. And with that comes new insight into healthy eating that is more than just conventional wisdom or gimmickry. The era of myth and marketing is at last giving way to an era of hard fact. You'll like some of the new insights, and you won't like others, but you'd best get used to them. Unlike the fads and fashions that have come before, the facts aren't going anywhere soon. Want to get healthy? then forget about diet soda and low-fat foods. Instead, tuck into some eggs, whole milk, salt, fat, nuts, wine, chocolate and coffee. It's true. 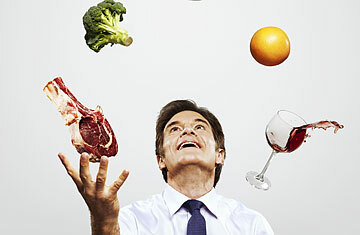 Despite conventional wisdom, all of those foods and many more can be beneficial to your body. But overindulge in them, and they can be as problematic as you've always been led to believe. The fact is that simple rules that divide things into good-food and bad-food categories tell you only a small part of the story. The rest of it is more complex than most folks know. See TIME's special health checkup: Who Needs Organic Food?